Dubai, United Arab Emirates – 21 March 2019: Sometimes it’s the simplest of things that makes life easier. 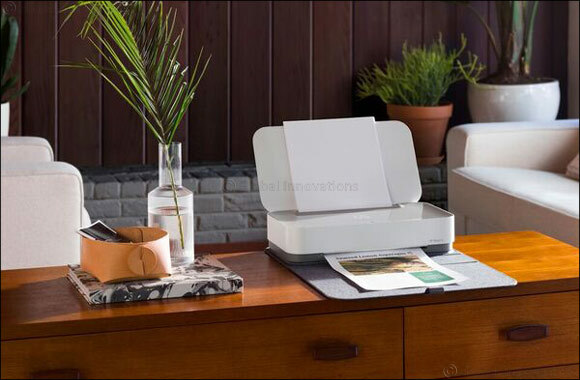 And this sleek, fully app-based, voice-activated printer, is it. With seamless set-up and cloud-based connectivity, you can print, scan and copy from anywhere. And, because it’s so beautifully designed, it will blend seamlessly into your home d�cor when not in use. Soft materials serve as both an aesthetic accent and paper landing zone. A “guided lighting” LED illuminates the paper tray when it’s printing or out of paper. Use the app to communicate with Tango. Print anywhere using cellular data or a remote WIFI connection. Never run out of ink. Order ink directly from the app or let Tango do it automatically with HP Instant Ink. Be notified when a print job is complete, how your ink and paper levels are, or if your cover is closed. Launched today, the HP Tango will be available in the UAE, to reinvent home printing for AED 799 (including the VAT). Download the HP Smart App from the Apple or Google Play Stores.